Whether or not the above story is true (it isn’t), the game Kangaroo bears a striking resemblance to the previously mentioned Donkey Kong. You are a mommy kangaroo hopping your way up a series of platforms in some sort of bizarre tree to reach your baby, which was stolen from you, presumably by small monkeys. Said monkeys climb up and down this tree, hurling their poop at you. OK, they look like small round objects that could be anything, and Wikipedia claims that they’re apple cores, but we all know what monkeys throw at people. As you ascend the tree you can collect fruit for points, in a vain attempt to get kids in the early ’80’s to think that eating fruit is cool because the kangaroo mom does it. Each level also has some sort of bell that, when rung, replaces all the already collected fruit with different kinds of fruit, waiting to be collected again: strawberries, apples, grapes, and uh, some sort of honeycomb? That’s what it looks like, anyway. Momma Kangaroo, unlike Mario, is not an entirely defenseless jumping character. If a monkey gets too close she can go all “maternal instinct” on it and punch its lights out. In fact, in one level there is a big stack of monkeys holding up the baby kangaroo like a totem pole and Mommy’s gotta sock each one out of the line-up to reach her little angel, lest the monkey stack get too large and start raining a hailstorm of crap on top of her. When she finally reaches her joey the game inexplicably plays “Oh, Susannah!” which is a real piece of Australia right there, and the game moves on to the next level. There are four in all, and when all four are beaten they start over, albeit with more monkeys and fruit. Even though this game bears some obvious Donkey Kong similarities, the gameplay is different enough to make it a new experience in its own right. The action never gets too complicated to be overwhelming, yet it’s difficult enough on the higher levels to be a real challenge. Although jumping over holes can be a bit tricky since Momma Kanga can’t move horizontally very well, it never gets frustrating. Give it a shot. As for me, I’m suddenly craving some Honeycomb! Honeycomb! Me want Honeycomb! The first thing you may notice on beginning to play Flying Ace is that you’ve immediately died. The second thing you may notice, after you get used to the controls being reversed and finally taking off, is how orange the ground is. This is supposedly some sort of WWI action game, where you are flying your biplane through enemy European territory, yet the landscape looks like at least Egypt, if not southern Nevada. The third thing you may notice is that you can only fly at one speed, your plane isn’t very responsive to your joystick (you have to hold a direction for at least a third of a second for the plane to respond, which doesn’t sound like much but can be death), and that hitting the ground isn’t actually hitting the horizon line or the line where the road is, but some arbitrary zone inbetween there. The fourth thing you may notice, after dying again, is that the gameplay is merely aiming and shooting slow-moving trucks on a highway without crashing into the arbitrary ground, and avoiding some black plane that you can sometimes shoot down or maneuver into the ground, but which comes back one second later. The fifth, and last, thing you may notice is that Blue Max is a much better game with the same premise on the Atari, and so you go play it instead. That’s Flying Ace! Hope you like Blue Max! Cloning was alive and well in the early ’80’s, as every single game on this disk is a near-clone of another more well-known game (except for Flying Ace, but that doesn’t make that game any good), and this Pacman clone is no exception. To be fair, I don’t even know if “Mouse” is even the name of this game, since there is no title screen, a search for “Mouse” in Atari search engines doesn’t bring this game up, and the creatures in this game really don’t look like mice. Oh, well. You play an unhappy ghost (for sake of awesome names from Pacman I’ll call your ghost Clyde) wearing cool shades and a dapper hat, filling in a maze with lines. Chasing you around this maze are three things that are mice, I guess, although they more resemble teddy bears than anything else. Like in Pacman the level is complete once you have visited every corner of it, and one touch from the enemy teddy mice is instant death. Death for a ghost, yeah, I know. You get no power-pellet-esque devices, however; instead, there are two types of objects you can pick up and drop off to throw off the mice. The first is some sort of cat head, which you can pass through and pick up but acts as a barrier to the mice. The second is a sort of trap that resembles a dotted box. If you get a mouse trapped in one of these you can grab it for extra points, after which it immediately respawns somewhere else in the maze. But beware: occasionally the new mouse will reappear with ominous-sounding music, sporting an ‘S’ on its chest. This is, of course, the fabulous “Super Mouse” which is identical to the other mice except that it eats the cat heads instead of being repelled by them. Catch a supermouse in a trap and you may get it to respawn as a normal mouse, but you only get a certain number of traps per level, so use them judiciously! I actually enjoy this game more than I do Pacman. It’s not just a matter of avoiding the mice whilst filling in the maze, it’s using the cat heads effectively and the traps in just the right spots so as not to catch two mice at once (for once you grab the first, the second will immediately wipe you off the face of mousedom, leaving only your hat to flutter softly away). This requires more strategy and planning than Pacman does, and I for one like it. Additionally, the two-player mode is a bonafide co-op game, where both players fill in the same maze at the same time. Props for that. So whether or not this game is actually called Mouse or not, it comes recommended. Download it if you can find it, and then tell me what the real name is. It’d be nice to know! Pacman goes Mexican in this delightful, yet frightening game! You’re a little chomper dude, chomping away at white dots in a maze. The twist is you’re actually a microscopic chomper, chomping away at microscopic white dots, leaving behind you a trail of, let’s say, crumbs, just to avoid two poop jokes in one review. Also prowling this maze is a number of tumble bugs: little blue nasty creatures. They mostly wander aimlessly through the maze, but if they stumble onto a crumb trail they will probably follow it until they catch up with you. (This means you can throw them off by taking one side of a fork, backtracking, and then taking the road less travelled by. It may make all the difference!) Since you’re so small the game employs a clever technique: it magnifies the area currently around you, and as you move around the maze the magnified area does too, even magnifying the score and time counters if you get near the top or bottom of the maze. In another bit of clever programming, if a bug catches you it uses actual voice simulation to spout something completely unintelligble (wiki gotcha?) at you. Then, the Vanna White bugs on the side of the maze do a little jig to the “Mexican Hat Dance” song. ¡Olé! 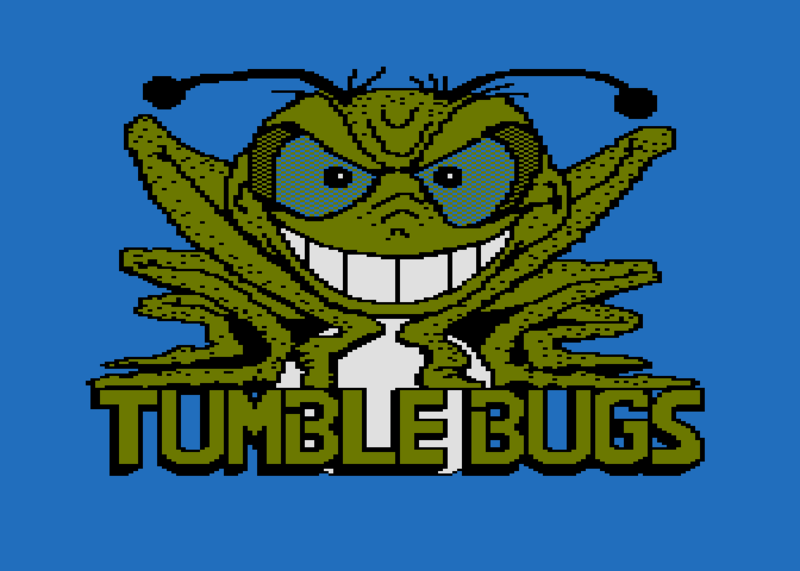 Tumble Bugs is certainly a piece of programming work, with the magnifying square and the speech (the latter heretofore unheard of in an Atari game and quite possibly on a home computer, period). The gameplay itself is pretty fun too, although it can get quite frustrating. The maze is randomly generated each time and there are quite a few bugs and no way to destroy or block them, which means if you go down a long dead-end passageway and a bug enters at the other end that you can’t see because it’s blocked by the giant magnifying window, then there’s nothing you can do but wait for the bug to scream “Whee! Bocce!” at you and start the maze over. Its frustrating flaws aside, Tumble Bugs is pretty fun, and as an added bonus, it has one of the most frightening title screens known to man. It would make an awesome guitar case sticker or possibly tattoo. In Space Invaders aliens try to land on Earth, only to be thwarted by the world’s state-of-the-art defense system and a bunch of late ’70’s college students with a lot of quarters. Apparently, their tried-and-tested method of slowly descending to a planet in rows hadn’t worked this time. So one day one of the generals (for sake of awesome Pacman names let’s call him Clyde) came up with a brilliant plan: descend on a planet in rows, but occasionally break off and fire at the defending ship! But then get back into the row! The row is tradition! You can’t mess with the row! History shows that wars are won by the side that refuses to alter its tactics! In any case, you, plucky defender, have once again been sent against this alien onslaught. Gameplay in Galaxian is similar to Space Invaders except you don’t get any shields, and the aliens dive at you one-by-one instead of line-by-line as a giant group when they reach the edge of the screen. Other than that, it’s your basic shoot-the-aliens to get a lot of points game. Galaxian, although not a complicated game by any stretch of the imagination, is still pretty fun and has achieved classic arcade status, and is now remembered as one of the most popular games of its time. Coming up next: side 2 of disk 11, featuring Salmon Run, Pharoah’s Curse, Submarine Commander, Pool, and Nautilus. See you then! Posted on February 2, 2009, in Atari Reviews and tagged atari, Atari Reviews, flying ace, galaxian, kangaroo, mouse, tumble bugs. Bookmark the permalink. 3 Comments. It’s called Mouskattack by John Harris (of Jawbreaker fame)!